"Magical stories unfurl with marvelous subtlety in this delightful collection from Klages." A rebellious child identifies with Maleficent instead of Sleeping Beauty. Best friends Anna and Corry share one last morning on Earth. A solitary woman inherits a penny arcade haunted by a beautiful stranger. A prep-school student requires more than luck when playing dice with a faerie. Ladies who lunch--dividing one last bite of dessert--delve into new dimensions of quantum politeness. At summer camp, a young girl discovers the heartbreak of forbidden love. 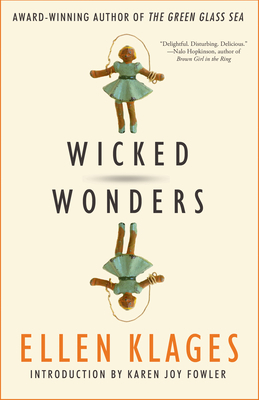 Whether on a habitat on Mars or in a boardinghouse in London, discover Ellen Klages' wicked, wondrous adventures full of cheeky wit, empathy, and courage. Ellen Klages is the acclaimed author of the Scott O'Dell Award-winner, The Green Glass Sea, and White Sands, Red Menace, which won the California and New Mexico Book awards. Her short fiction, previously collected in the World Fantasy Award-nominated Portable Childhoods, has appeared in numerous magazines and anthologies, and has been translated into more than seven languages and republished worldwide. A graduate from the Second City's infamous Improv Program, Klages also holds a degree in philosophy, which led to many randomly-alliterative jobs such as proofreader, photographer, painter, and pinball arcade manager. She lives in San Francisco, in a small house full of strange and wondrous things. Karen Joy Fowler is the author of twelve novels and fiction collections, including the New York Times bestsellers The Jane Austen Book Club and We Are All Completely Beside Ourselves. She is the recipient of the PEN/Faulkner, World Fantasy, and Nebula Awards, as well as the Commonwealth Medal and the International Fiction Prize. Fowler lives in Santa Cruz, California.